Tails are another one of my favorite parts from a hog. They don’t look like much. But the texture and taste are both awesome. They are similar to ox tails, but smaller, sometimes leaner, and usually sold with skin on. They can be cooked in soup, braised, or deep fried. Different cooking method would bring out different flavors. After trying most cooking ways I can think of, smoking-and-then-braising becomes my new favorite way to cook them. nlike what I used to buy from market back in China, the tails sold in America grocery market are much shorter, thicker and fattier. 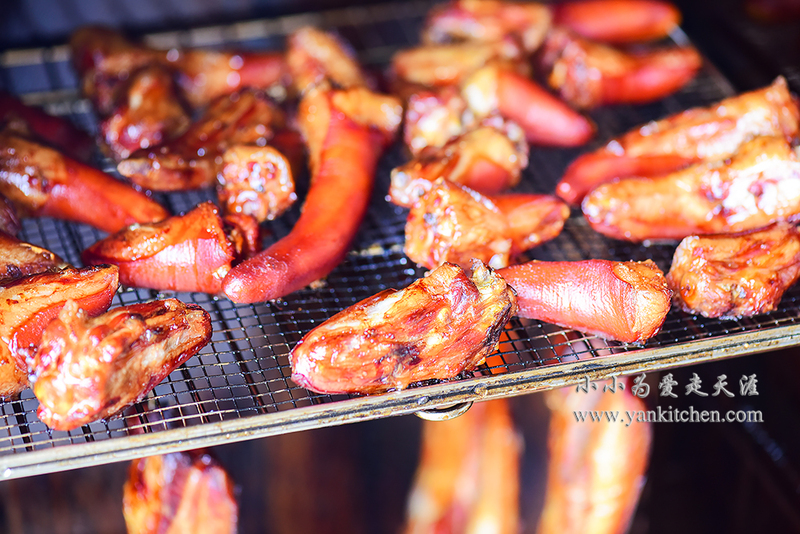 Hours of smoking process can help to get rid of excessive pork fat. Cleaning pig tails under running water. Pat dry with kitchen paper towel. Smoke them in smoker for 3 to 4 hours. The exterior becomes dry, crunchy and crispy. Most excessive fat has dripped away in smoking process. Add smoked tails to a cast iron pot, along with water, spices and seasonings. Cook over high heat until water boils. Reduce heat to simmer for 1 1/2 to 2 hours. Turn the heat back to high, add salt to taste, and cook until most liquid evaporates. Tails are amazing part from hogs. They are mostly bones and skins, not much meat attaching to them. After long hours’ simmering and braising in soy sauce and spices, the lean meat part is soft and moist; and the skin part is soft and slightly chewy and al dente.